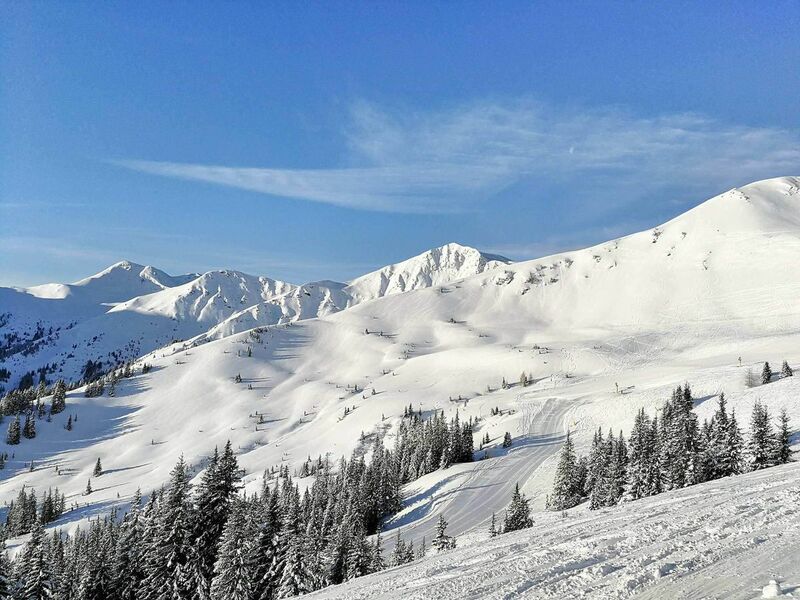 Saalbach is one of Austria’s premier ski resorts and probably one of the most popular and lively winter-sports holiday destinations in the Alps. It offers a wide range of runs and challenges for skiers of every level and a vibrant apres-ski. Originally comprising two sides of the long Glemm valley the resorts Saalbach and Hinterglemm have been connected to include Leogang and Fieberbrunn both one valley across. And even a further extension to Zell am See is planned. On the basis of the resort's official figures, verified by consultant Christoph Schrahe, this is Austria’s second largest interconnected ski area (after Arlberg). There is a wide variety of terrain from easy beginners slopes to challenging blacks and pretty reasonable off-piste. This is a great resort for all abilities with mostly blues and reds, the odd long black run and some very pretty scenery including some lovely tree runs. Slopes are well-groomed, well-marked and most of them very wide. Many slopes are below the treeline which improves the visibility in bad weather conditions. 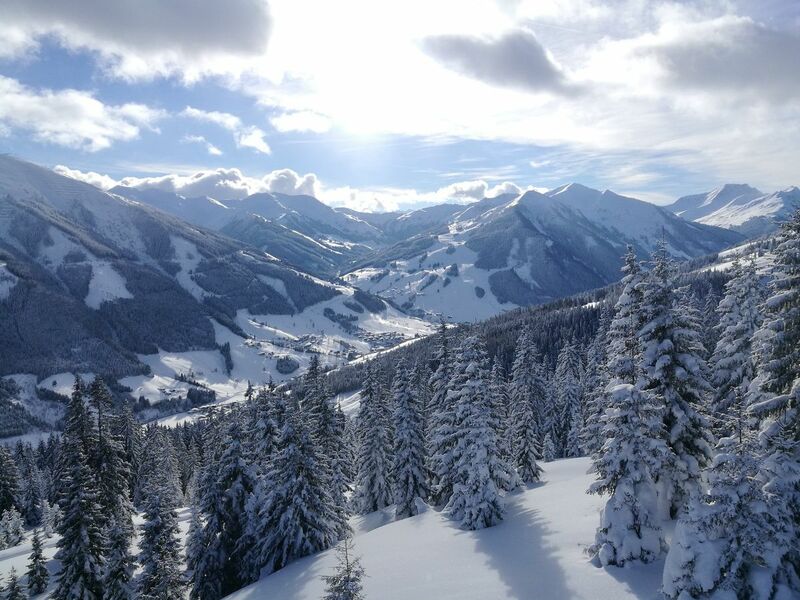 Altogether, this makes Saalbach very suitable for beginners and skiers with medium skill. Moreover, the ski area is well laid out with numerous access points allowing you easy access to 270 kilometres of world-class skiing. There clearly has been a lot of investment in the ski lifts in recent years, many of the older queue prone ones replaced by modern high capacity ones. The ski area directly surrounding Saalbach predominately consists of wide motorway blue and red pistes, a lot of them long and perfect for cruising yet with a high proportion of unrelenting high-end intermediate challenges too. A few of the runs on the lowest flanks of the valley cut through attractively wooded areas, but the majority of the slopes are open and above the tree line and the pistes are nicely inter-spaced with plenty of powderfields in the periods following fresh snowfalls; all sectors are well-served with lively mountain bars and good restaurants. The runs on the north side of the valley (south-facing side) tend to be preferred by visitors due to their sunny weather. The pistes on the south side of the valley (north-facing side) are normally in the shade, so have better snow cover, particularly in late season, as well as more trees. Much of the off piste skiing is found on the north side, where thigh-deep, untouched powder can be found only metres from many of the pistes. The Skicircus challenges its guests with the most demanding ski circuit. The figures speak for themselves: 72 kilometres, 32 lifts and approx. 7 hours skiing time! The „Skicircus Circuit“ in the „Home of Lässig“ is doable within 7 hours for ambitious skiers. The Skicircus Challenge ranks among the top ski routes in the Alps and even overshadows the “Sellaronda”, the “White Ring” or the “King’s Tour” (Königstour). Travelling anticlockwise, you can make a full circuit of the valley on skis, crossing from one side to the other at Vorderglemm and Lengau – if you wish you can stick to blues almost the whole way. Clockwise, you have more red-run skiing and a short circuit through Saalbach. The Skicircus Challenge starts with the two-stage Schönleiten cable car near Vorderglemm, which underwent complete renovations for the 2016/2017 ski season. From the summit station of the Schönleiten cable car, you will take two more lifts before reaching the Asitzgipfel, in the heart of Leogang. Before you lies the valley run, which will take you to the Steinberg cable car – a bit flat but otherwise a very enjoyable piste, especially in the upper part. Leogang is a good alternate starting point for the Skicircus Challenge, thanks to the plentiful parking spots at the valley stations. From Bernkogel, continue on to the Reiterkogel, which will connect you to Fieberbrunn, the newest member of the ski circus. This ski area in the Tyrolean Pillersee Valley has been linked to the Saalbach- -Hinterglemm resort since 2015-16 via the Tyrol S-Bahn. Here you’ll find some challenging red slopes, notably the piste leading from the Hochhörndl 4er down to the Tyrol S-Bahn. The valley run to Fieberbrunn is also well worth it. The only small drawback to this part of the skicircus is that it requires riding quite a lot of lifts, which means the Fieberbrunn portion takes almost 1.5 hours to complete. The next stop on the Skicircus is Hinterglemm. The official route sends you through the Sunliner before taking you to the Hasenauerköpf lift. There are a few extra options here if time permits. Take the new 12er-Express across the valley: the highlight of the Zwölferkogel is the World Championship piste, which brings you to Hinterglemm’s Westgipfel lift. This downhill course is not an official part of the challenge, but it is one of the most beautiful pistes in the Saalbach-Hinterglemm ski area. The long north run from the Schattberg at Saalbach is notorious for being steep, shady and challenging. enjoy panoramic views as you ski down to the valley station of the Schönleiten cable car via the kilometre-long Jausernabfahrt piste, one of the longest valley runs in Austria, which will put you back on track towards Leogang. Despite four resorts joining forces to create a huge ski region, each area remains quite different; each with its own strengths and target groups. Leogang is without doubt the best destination for families, as there is a huge children’s ski area close to the valley, and the slopes here are a little less busy. In Saalbach and Hinterglemm in contrast, advanced skiers and those who enjoy eating up the kilometres will love being in the heart of such a huge swathe of terrain. Hinterglemm is without doubt the place to be for party, and it has now established a reputation as being one of the top après-ski destinations nationwide. Fieberbrunn, in contrast, has gone all-in for freeriders, now enjoying a global reputation in this regard. By air: Salzburg's W.A.Mozart Airport is closest and offers shortest transfer times to Saalbach (1 hour 20 minutes), followed by Innsbruck (2 hours 15 minutes) and Munich (2 hours 30 minutes). By train: buses leave every hour from Zell am See station. The journey takes 40 minutes-or just 20 minutes by car.